I’ve mentioned loving Wet ‘n Wild’s Color Icon Bronzer in Reserve Your Cabana as a cheekbone highlight, so I was super excited when I found out that they released a highlight powder in their Fergie line! There were two shades, a bronze and a champagne, and I picked up the champagne shade: Rose Champagne Glow. THIS CALLS FOR A COMPARISON POST! Packaging: Both have plastic packaging with a lid that clicks shut. However, Reserve Your Cabana has a much flimsier lid, while the Fergie compact is made of a sturdier black plastic (although still not comparable to a high-end compact). 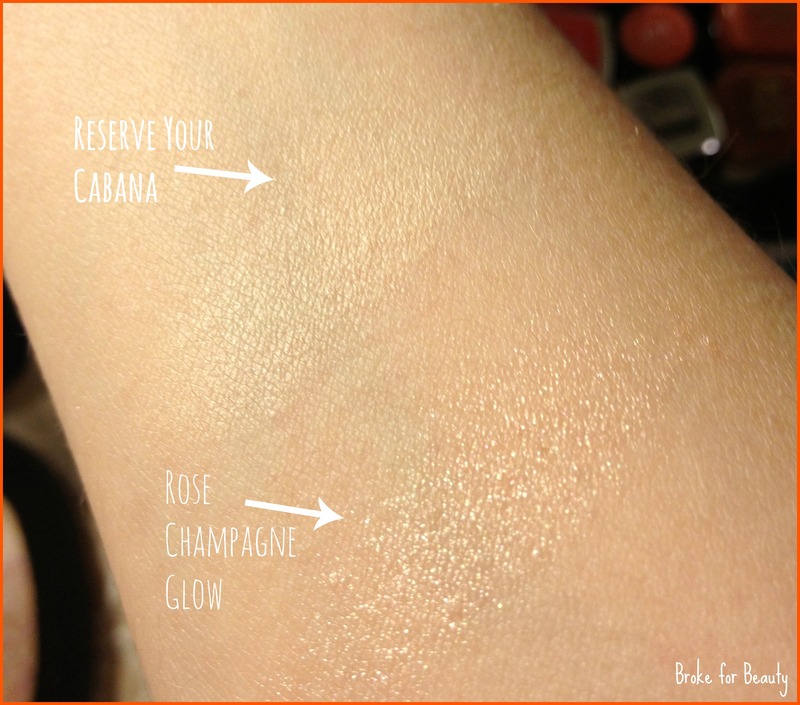 On the skin, Reserve Your Cabana shows only a very slight color, while Rose Champagne Glow is a little bit pink. Both are nearly invisible and simply catch the light. Texture: RYC is a soft, fine powder with super fine and subtle shimmer. RCG is slightly grittier with more shimmer. As you can see, they come off quite differently on the skin. Final Thoughts: These highlight powders are so different, it’s hard to compare them! Overall, I love both of these, but they serve very different purposes. Reserve Your Cabana is much more subtle and great for day-to-day. The beige base makes it blend really well into my skin tone so it just gives off a teensy bit of shimmer in the light. Beautiful. It doesn’t do as well in the inner corners of the eyes and on the cupid’s bow, as it’s so subtle, but it does work well under the brow (I prefer other products for that, though). I honestly just use this on the cheekbones, and swipe the excess down the bridge of my nose. Rose Champagne Glow is a bolder shimmer for when I want a stronger highlight. The pinkish tone gives it a really beautiful glow on the skin. It also works really well as an eyeshadow and inner-corner brightener! I don’t love it under my brows because I like satin finishes for that, and I wouldn’t use it on my forehead or nose either. It’s fantastic on the cupid’s bow since it catches the light so well. So, the bottom line is that RYC is perfect if you want a subtle cheekbone and brow highlight for every day, while RCG is better if you’re looking for something that pops and can be used for multiple purposes. The best part is that they’re both super cheap! Which do YOU choose? Battle it out in the comments! And make sure to let me know what other highlighting products you love. Their eyeshadows and highlight powders are really a must! Excellent quality, and so affordable. I’ve never tried the lipsticks. I’ve heard they’re drying, which scares me, but I think I should just go for it. Thank you for your review, it was very helpful 🙂 I think I’m going for the RYC! I’m glad you stopped by! 🙂 RYC is great because it’s so natural and can even be used all over the face for a little glow. It just won’t have that “wow” effect in terms of shimmer.